On Wednesday afternoon, October 10, 2018, Hurricane Michael crushed portions of the coast of Florida and caused tornadoes in Florida and southern Georgia, before heading toward already ravaged areas in South Carolina and North Carolina. 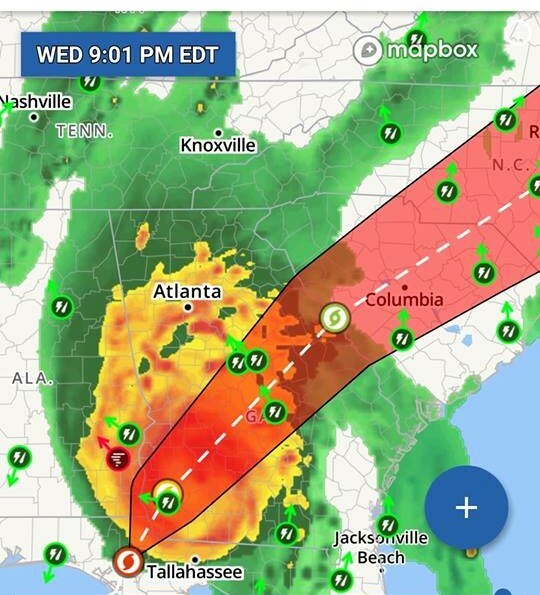 Hurricane Michael entered Georgia around 5 PM as a Category 3 storm. I heard of one report of a tornado watch for Oakwood, Georgia, and saw another on The Weather Channel for Winder. We might not know the extent of damage in the southeast for days. Georgia DOT released this information at 3:00 PM on Wednesday. ATLANTA, GA – Hurricane Michael is currently a category 4 major hurricane that has made landfall along the Florida panhandle and will accelerate northeast into southwest and middle Georgia tonight. In accordance with Governor Nathan Deal’s seven-day state of emergency declaration, which was expanded to include 108 counties located in the south and coastal areas of Georgia, Georgia DOT has prepared on a statewide level in partnership with the Governor’s Office, Georgia Emergency Management Agency, the National Weather Service and state and local officials. With wind gusts of more than 70 mph where the Hurricane Warning is in effect, and 40-60 mph in the area of the Tropical Storm Warning, maintaining roads and bridges is essential before, during and after the storm. For the public’s safety, in anticipation of gale-force winds GDOT will close the Sidney Lanier Bridge on US 17/SR 25 in Glynn County at 6 p.m. and the Talmadge Bridge on US 17 in Chatham County at 9 p.m. on Wednesday, Oct. 10. As the storm continues to move east/northeast, teams will monitor the need for other bridge closures in coastal Georgia. GDOT Special Response Teams will begin clearing impacted roadways once the worst of the storm passes. In the event of major flooding, crews will wait until waters recede to begin clean up. Priority routes will be cleared first to ensure the public maintains access to hospitals, trauma centers and other public facilities. As Hurricane Michael moves through Georgia, motorists are encouraged to use caution to ensure their safety and be cautious of strong winds, flooding, downed power lines and the potential for falling trees. For real-time road conditions, call 511 or visit Georgia511. For weather information, visit the National Weather Service in Tallahassee, Florida, or the National Weather Service in Peachtree City, Georgia. Robert J. Sutherland is a travel writer enjoying life in Gainesville, GA. Robert has two adult daughters, seven practically perfect grandchildren and a zippy Kawasaki. Contact Robert at RJSutherland@hotmail.com. 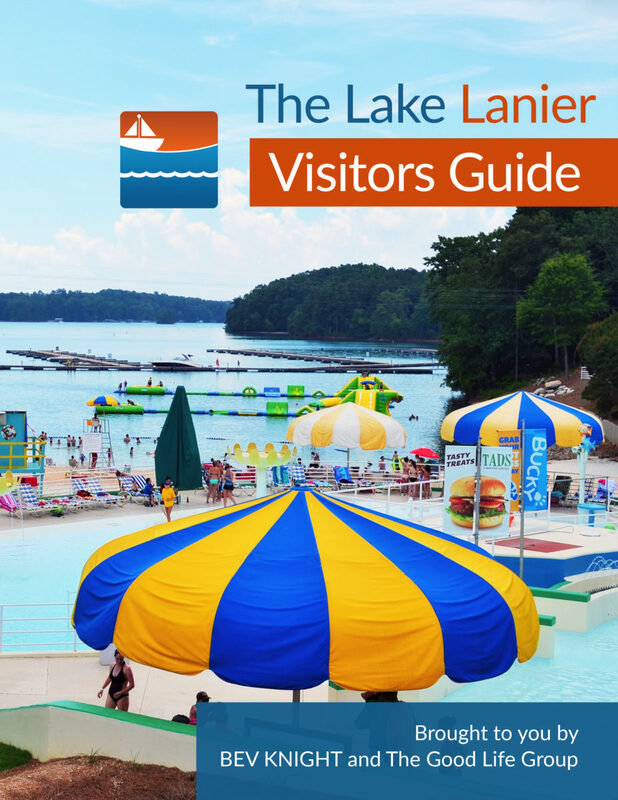 The Lake Lanier Visitors Guide is now available!